Selected from our range of FSC® certified timber Garden Sheds, this 1.8 x 3.0m Classic Shed was recently installed for a customer based in Stragglethorpe, Nottinghamshire. Designed and built by hand in Norfolk, the shed was both delivered and assembled at the specified delivery address by our in-house installations team. Fabricated entirely from FSC® certified timber at our Norfolk factory, this attractive Superior Shed was recently delivered and installed by our expert fitting team at the customers address in Bingham, Nottinghamshire. 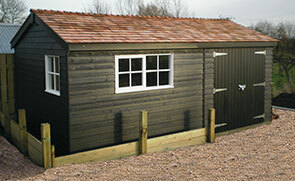 One of our attractive Superior Sheds was recently installed for a customer based in Beeston, Nottinghamshire. As with all of our FSC® certified timber buildings, the shed was designed and hand-built by expert craftsmen at our Norfolk factory, before being delivered and installed by our in-house fitting team. 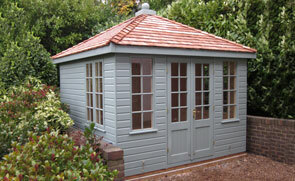 This spacious Garden Room was recently installed for a customer based in West Bridgford, Nottinghamshire. 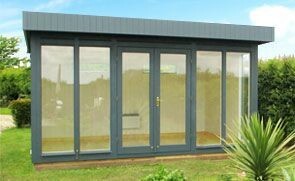 Selected from our range of superior quality FSC® certified timber buildings, the Garden Room was designed and built at our Norfolk factory before being delivered and installed by our in-house fitting team. This contemporary and chic Salthouse studio was recently installed for a customer based in Epperstone, Nottinghamshire. Built entirely from FSC® certified timber and featuring double-glazed windows, the studio is the perfect choice for year-round use or a work-from-home office. This charming Blickling Shed from our National Trust range was recently installed for a customer based in West Bridgford, Nottinghamshire. Named after the breath-taking Blickling Estate in Norfolk, this building measures 2.4 x 3.6m and boasts distinctive, classical features such as a built-in logstore, cast iron door furniture and corrugated sheeting on the roof. This 2.4 x 2.4m Weybourne Summerhouse was recently installed for a customer based in Nottinghamshire who wanted to make the most of their garden, explaining their choice of the ideal corner-plot building. This leaves them with maximum outdoor space as well as a wonderful warm retreat where they can sit and admire the resident flora and fauna. 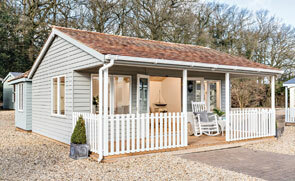 We recently installed this charming Blickling Shed for a customer in Thrumpton, Nottinghamshire. Selected from our National Trust collection, this beautiful design is inspired by a bygone era and classical tradition. Some of the more distinctive features are the rustic-cut vertically-sawed cladding made from our FSC® certified timber, and the charming built-in log store that is both functional and attractive. This traditionally attractive Cley Summerhouse is 3.0 x 3.6m, and it has been installed in our customer’s wonderful maze-like garden in Newark, Nottinghamshire to use as a sheltered base to enjoy their garden from, whether that is for entertaining or just relaxing. A modern-style building with a pent roof, this Salthouse Studio has been installed in our customer’s garden in Gamston, Nottinghamshire to use as both a garden storage shed, and an office for the customer to work from home out of.